This is a good station for kids to work on passing and shooting. It is continuous so it requires kids to maintain focus and introduces them to passing and receiving on the move. 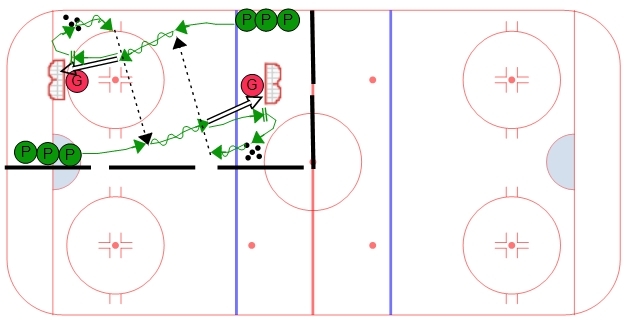 To start the drill Player #1 will carry the puck down to the opposite net and shoot. The player should work on stopping at the net and then a quick first three strides to get a loose puck. Once they get a loose puck the next player from the other line (Player #2) skates up ice, receives a pass from Player #1 and shoots on net. Player #2 will then stop at the net, get a loose puck, and make a pass to Player #3. The drill continues back and forth. Why I can’t I just save this drill. It’s annoying not to save when I payed for year worth. Pass and shoot. Consider long cross ice pass.